1. In a large bowl, whisk together the water, oil, sugar and yeast. Set aside the mixture for 15 minutes to hydrate the yeast. 2. Stir in the salt and two-thirds of the flour, 1 spoonful at a time, to achieve a very soft dough. 3. Turn out the dough onto a well-floured board and continue kneading in additional flour until a soft, sticky dough is achieved. The dough should be very moist; the more flour added, the heavier the dough and final crust. 5. When the dough has doubled in size, punch it down and turn it out onto a floured board. Halve the dough and roll each half into a ball. Place on the floured board and lightly flour the tops. Loosely cover each ball with plastic wrap and set aside until almost doubled again. 1. In a medium saucepan heated over medium heat, add the oil, garlic and onion. Cook, stirring occasionally, until the onion is translucent, careful not to burn the garlic. 2. Stir in the tomatoes, tomato paste, salt and sugar. Cover the pan and gently simmer for 15 minutes, stirring occasionally. Remove from heat and stir in the herbs. 3. Pass the sauce through a food mill, or purÃ©e using a food processor or blender. This makes 1 scant cup tomato sauce. Cover and refrigerate until needed. You'll enjoy a light crust, bright sauce and array of colorful toppings in this pizza from Cafe del Rey in Marina del Rey, CA. The restaurant was happy to share its recipe, which has been adapted below. The recipe makes two pies, perfect for company. 1. In a large mortar and pestle or using a food processor, grind together the garlic, pine nuts, chili flakes, Parmigiano and olive oil. Add the basil leaves, a few at a time, until they are incorporated and a coarse paste is formed. 2. Taste and adjust seasoning as desired with additional Parmigiano, lemon juice, pine nuts or olive oil. Thin as desired with a little olive oil. 3. Refrigerate the pesto in a nonreactive container with the surface covered with plastic wrap until needed; the pesto will keep for up to 1 day. 1. 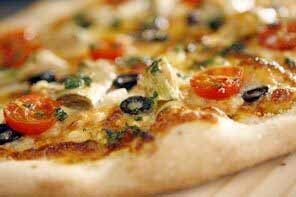 Place a pizza stone on a rack in the oven, and heat the oven to 450 degrees. 2. Roll out each dough ball to a 12- to 14-inch round and place on a floured pizza peel. Divide the sauce between the two rounds, ladling evenly over each round and leaving a 1-inch border around each. 3. Sprinkle the mozzarella and feta evenly over the pizzas, and garnish the top of each pie with the tomatoes, olives and artichokes. 4. Gently slide the first pizza on the stone. Bake until the crust is puffed and golden-brown, about 8 to 10 minutes (timing will vary depending on the thickness of the pie and heat of the oven). Remove the pizza and slide the second into the oven. Cool the pizzas slightly, then spoon the pesto over and slice. Serve immediately.